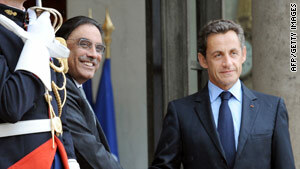 France's President Nicolas Sarkozy (right) welcomes Pakistani President Asif Ali Zardari to the Elysee Palace. Paris, France (CNN) -- The international community is "losing the war against the Taliban," Pakistani President Asif Ali Zardari said Tuesday. "Above all, this is because we lost the battle of hearts and minds," Zardari told the French newspaper Le Monde on a visit to Paris. "The success of the insurgents is to learn how to wait. They have time on their side. It's our whole approach which is wrong," the paper quoted him as saying. "The people do not associate the intervention of the coalition with a brighter future." Zardari and his entourage were on a plane from Paris to London, England, and not immediately available to confirm the quotes, a representative of the Pakistani Embassy in London told CNN. The president doubted the Taliban could be defeated by force alone, Le Monde reported. "The military reinforcements are only a small part of the answer," he said. "To win the support of the Afghan people, we must bring them economic development and prove that we can not only change their life, but also improve it." The United States is leading military efforts against the Taliban in Afghanistan, which neighbors Pakistan. The new commander there, Gen. David Petraeus, issued new guidelines Sunday for U.S. and allied troops fighting there. They include: Fight the Taliban "relentlessly." Don't tolerate corruption. Drink "lots of tea" with the locals. In his first major public pronouncement since taking command in early July, Petraeus urged American troops and the NATO-led International Security Assistance Force to learn and adapt to the culture of Afghanistan while battling the Taliban insurgents and their allies. Petraeus led the 2007-2008 campaign to stabilize Iraq after years of insurgent and sectarian warfare following the U.S. invasion of 2003. Some of the steps he took there -- ordering troops to work in closely with local allies in outposts close to the people, patrol on foot and without sunglasses and cultivate ties with the local population -- are included in Sunday's four-page order. "Earn the people's trust, talk to them, ask them questions and learn about their lives," he wrote. Coalition troops should be "a good guest," learn the local history and "make sure you have the full story." "Don't be a pawn in someone else's game," he wrote. "Spend time, listen, consult and drink lots of tea." Petraeus called on American and NATO troops to "pursue the enemy relentlessly" and "seek out and eliminate" insurgents who threaten Afghan civilians. But he also urged coalition forces to fight "with discipline" and be careful to avoid civilian casualties. "If we kill civilians or damage their property in the course of our operations, we will create more enemies than our operations eliminate," he wrote. "That's exactly what the Taliban want. Don't fall into their trap." He urged his troops to aggressively fight the Taliban by being "first with the truth," acknowledging setbacks and failures but highlighting the "extremist" and "oppressive" nature of the enemy. Allied forces should "hang their barbaric actions like millstones around their necks," he wrote. And in a country where corruption is endemic, the Petraeus guidelines press allied forces to be mindful of where coalition money goes and to help Afghans "confront, isolate, pressure and defund" crooked elements. "The Taliban are not the only enemy of the people," he wrote. "The people are also threatened by inadequate governance, corruption and abuse of power -- recruiters for the Taliban." Afghan President Hamid Karzai has pledged to root out corruption, and allied troops should "work with our allied partners to help turn his words into reality," Petraeus added. Petraeus has taken command at a time when the nearly 9-year-old war is the subject of fierce debate in the United States and in many of the countries that have contributed troops to the mission. A highly publicized offensive in the southern town of Marjah has turned out to be less fruitful than expected, Petraeus acknowledged in June. Meanwhile, widely reported plans for an offensive in the Taliban heartland of Kandahar have been replaced with a slow buildup of forces around the city in conjunction with Afghan troops. In addition, the Netherlands finished pulling its troops out of southern Afghanistan's Uruzgan province Sunday after four years and 24 combat deaths, nearly six months after an impasse over whether to extend their commitment brought down the Dutch government. CNN's Saskya Vandoorne and CNN Pentagon Correspondent Barbara Starr contributed to this report.